I often get asked for matching sets of plastic for Les Pauls. The Vintage Haven parts are primarily intended to mimic late fifties parts. 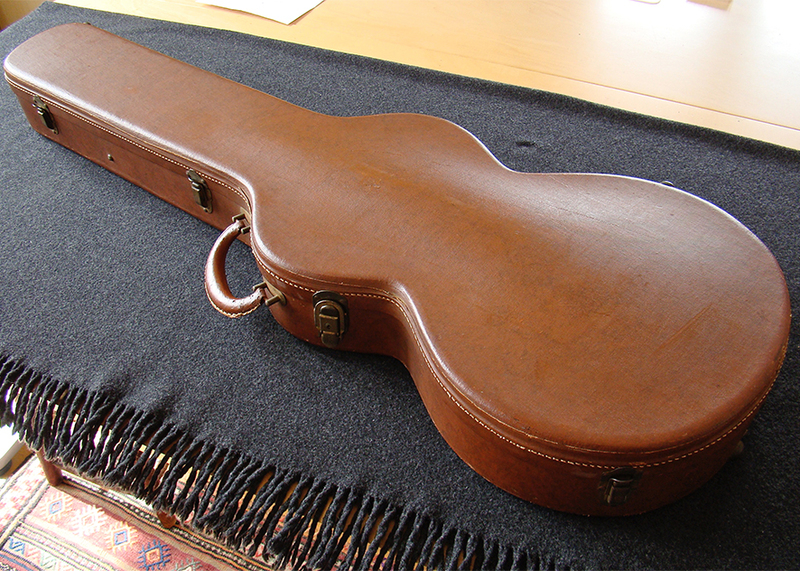 They were originally developed for original guitars requiring missing or broken parts and for high end replica builds. The whole parts swapping thing on Gibson reissues is a relatively new phenomenon (well, to an old guy like me anyway). 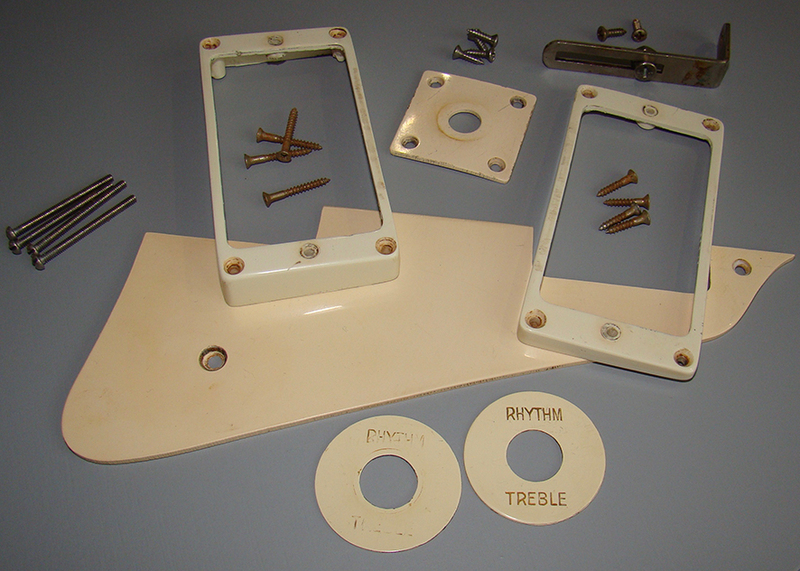 The 1950s guard and jack plate, M69 surrounds and the switch ring were manufactured in different types of plastic material. They never matched even when new let alone after fifty plus years of use. The typical “look” on the vast majority of original Bursts is the guard being slightly darker than the surrounds and switch ring. If you want them to match for your guitar thats fine, but if you are looking for an authentic look don’t go for matching plastic. The photo shows a recently completed order. This is what I would suggest as a correct look. Strong red sunbursts look better with a darker cream surround and dark guard while gold tops and faded tops look better with the lighter bone colour. This is a true Cali girl case. These were mainly supplied with 1956/1957 Gold Tops. “Cali girl“ is a frequently mis-used term, only this figure of eight shape with the very narrow waist is a true Cali girl case. This particular example is the cleanest one I have ever seen. It is in near mint condition and has obviously never been taken on the road and slung into the back of a van in its life, probably never seen the inside of a van. 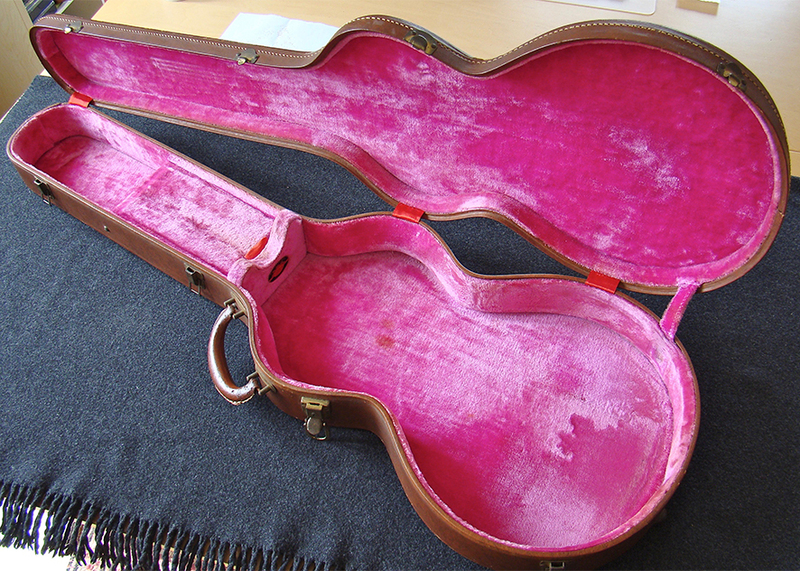 These cases are very rare and in this condition crazy rare. It is without doubt one of the best examples on the planet. I bought this in Japan and it was sold recently to a collector in Sweden. I deeply regret letting it go as I know I will never see another one in this condition. The well documented issue of late fifties Kluson tuner buttons deteriorating over time has never really been explained fully. It seems that a change in the plastic formula was implemented either deliberately or by accident around 1958/59. These late fifties tips had a chalky look with little or no “swirl”. The tips prior to this change had a more translucent look often with distinctive swirls. The plastic changed again sometime in the early sixties (just after they went to the double ring style) and was much less prone to disintegration. These have the characteristic “snot green” colour, a greyish/green look. The photograph above shows a near mint 1959 tip a 1960 “double ring” which is just starting to go and a 1959 “mummy finger" almost at the point of total failure. 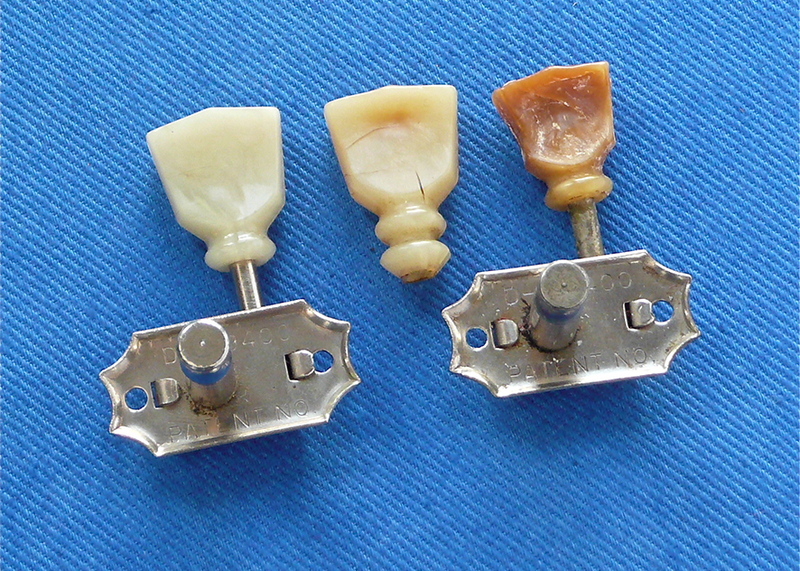 Vintage Haven replacement tips are the best available solution if you need to replace your crumbling tip!